Brake fluid leaks may pose a little challenge sometimes. First, there could be more than one reason why the fluid in the master cylinder reservoir is low: Probably you need to replace some worn out brake pads or shoes, or a worn out or damaged component is causing a gradual leak. Second, leaks will also happen internally, and you can't just tell by checking the reservoir. 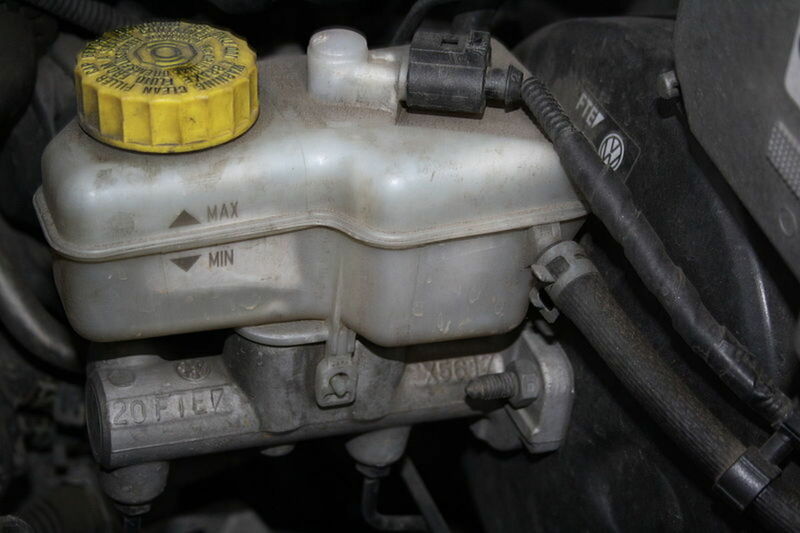 For example, a worn out component inside the master cylinder may cause fluid to flow from one chamber to the next without you being able to notice. Either way, you still need to check the system at the first sign of trouble. You can do a preliminary inspection at home, in your own garage. The sooner the better. This guide will help you understand the system, what components you need to pay attention to, and what to look for. 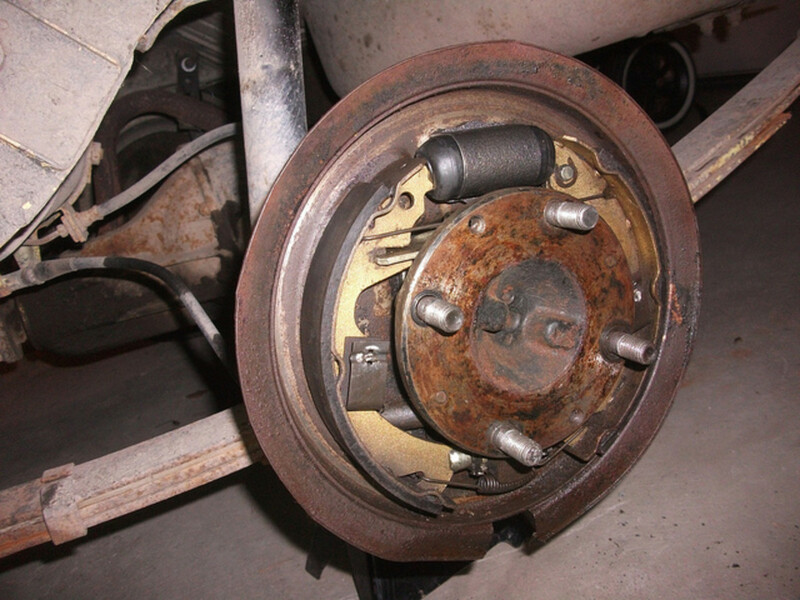 So let's start with a brief overview of the brake system in your car. The brakes in your vehicle use a hydraulic system to operate. 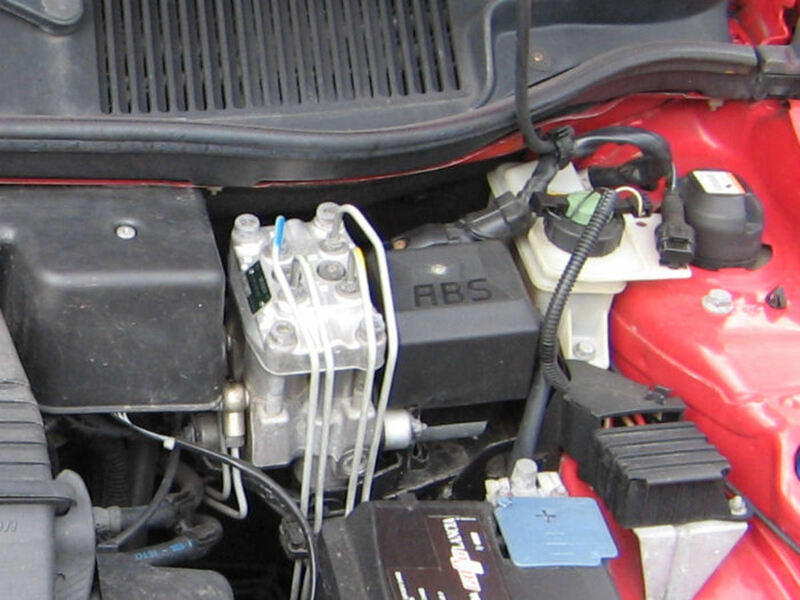 To transfer braking power, brake fluid travels through a series of metal-tubing lines and rubber hoses that connect the main system components. Broadly speaking, the brake lines connect a master cylinder — a hydraulic pump — to a hydraulic modulator — on vehicles equipped with ABS (anti-lock brake system) — and to wheel brake assemblies. These component assemblies, connectors, even lines and hoses, all are potential points for leaks. Usually, you become aware of a potential leak when you see the warning light on your dashboard telling you brake fluid level is low, or discover the telltale patch of fluid on the floor of your parking spot, or find yourself adding fluid to the brake master cylinder on a regular basis. Now you need to confirm your suspicions. But modern vehicles come equipped with complex brake systems and are certainly difficult to diagnose when trouble arises. Still, you can do a preliminary inspection of the brake system even if you know little about cars. Knowing what to check can lead you to the source of the problem. Here's what you need to check. If you suspect a brake leakage after finding a fresh puddle underneath your vehicle, and confirming the brake reservoir needs fluid, you may find it easier to locate the leak source. Closely inspect the liquid on the floor and try to determine the type of fluid. Compared with engine and transmission oil, brake fluid is colorless and lighter. But you still may confuse brake fluid with power steering fluid. So check the power steering fluid level in your car to discard a leak, if necessary. Jack up the car on the side closest to the suspected leak and secure the vehicle with a jack stand. Block the rear wheels and engage the parking brake. Depending on the location of the patch of fluid on the floor, check for the most obvious dripping source in the brake system: Brake master cylinder, brake caliper (disk brakes), wheel cylinder (drum brake), hydraulic modulator (anti-lock brake systems), brake hoses and lines. If you found the leak near the side of the steering wheel, pop the hood open and look for signs of moisture or darkened wet areas around the brake master cylinder, the line connections around the unit, and the brake booster. If the leak is closest to one of the wheels, jack up the car on that side and secure the vehicle with a jack stand. Then, inspect behind the tires and wheel assembly. 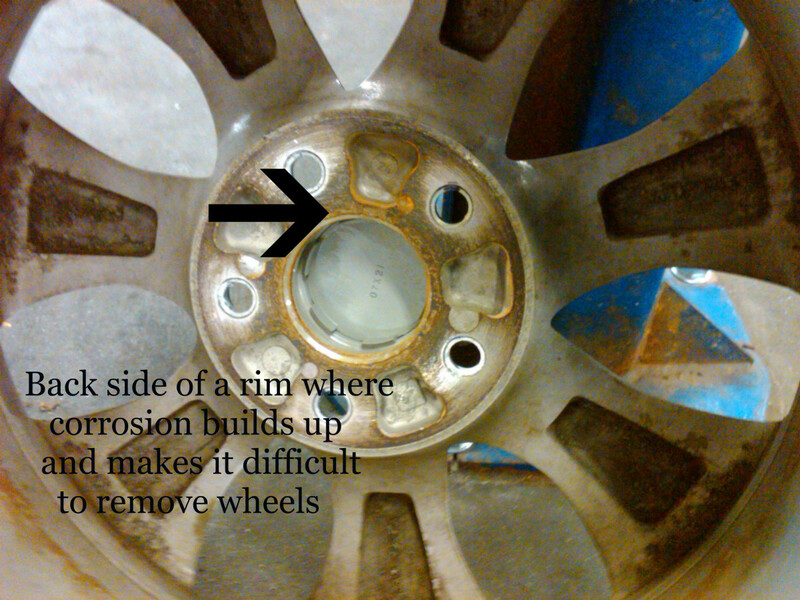 Look for signs of moisture or wet areas around the tire wall, brake hoses and calipers. If you had your car in the shop for brake work, closely check the bleeder valve on the back of the caliper. It might be loose and dripping fluid. 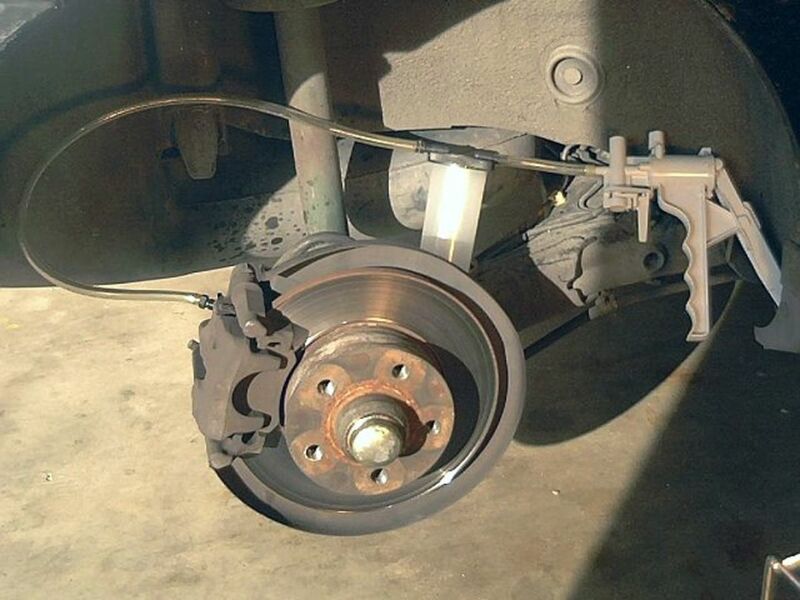 You may need to remove a tire to inspect the condition of a caliper or wheel cylinder closely. If the location of the pool of liquid points to any other area around the vehicle, you may be dealing with a leaking brake line or a modulator unit (on anti-lock brake systems). Jack up and secure the vehicle with a jack stand. 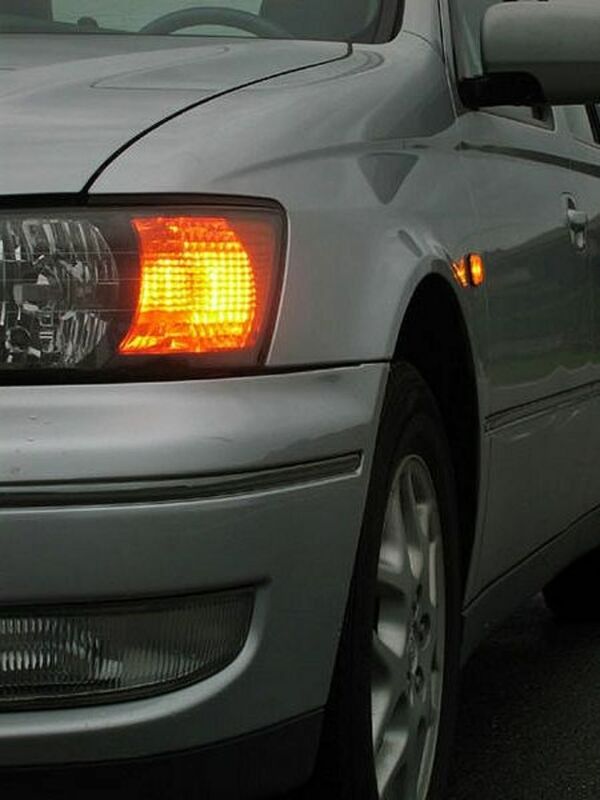 Use a flashlight to closely trace and inspect lines and any other devices related to the brake system. When the low-fluid light comes on, check the brake master cylinder first. If you pop the hood of your car, you'll find the master cylinder mounted in front of the brake booster, a round, drum-like component attached to the firewall on the driver's side. The master cylinder is a metal cylinder with a reservoir container on top and four metal lines connected to it. The master cylinder can develop external or internal fluid leaks after miles of service. 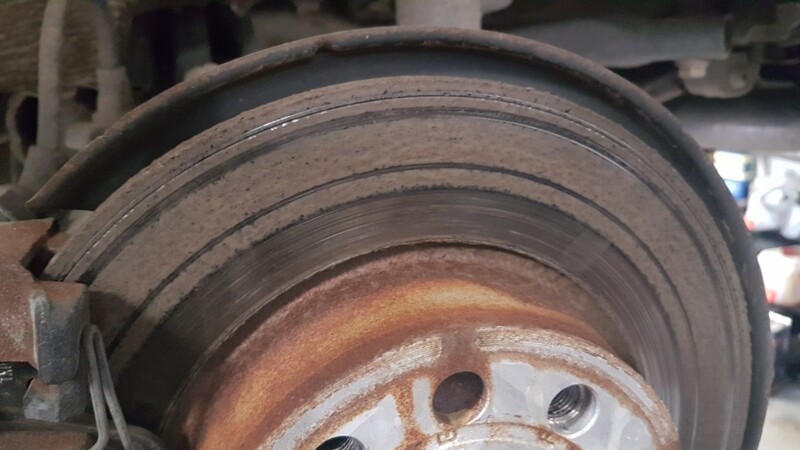 External leaks usually show up as darkened, wet areas between the cylinder and the brake booster. Internal leaks, on the other hand, will hide from you but not completely. This problem develops when the master cylinder's internal piston cups or seals wear out, and pressure begins to leak pass that point but not outside. Still, you'll notice the symptom when driving. When you apply the brakes and come to a full stop, the brake pedal slowly sinks to the floor. Pumping the pedal usually brings it back to normal operation. With a master cylinder leaking internally, you won't notice a lack of fluid because the fluid only transfers from one side of the unit to the other. Whether you're dealing with an external or internal master cylinder leak, the best way to fix the problem is to replace the unit with a new or rebuilt master cylinder. To better inspect a brake caliper, you need to remove the wheel. If you want to check more than one caliper, inspect one assembly at a time. Loosen the wheel lugs, raise the tire and wheel assembly using a floor jack and support the vehicle with a jack stand. Then, remove the wheel and tire assembly. Closely inspect the brake hose as it connects to the back of the caliper and the bleeder valve at the back of the caliper. Look for wet surfaces and signs of damage. Also, look for wet spots on the brake disc itself. 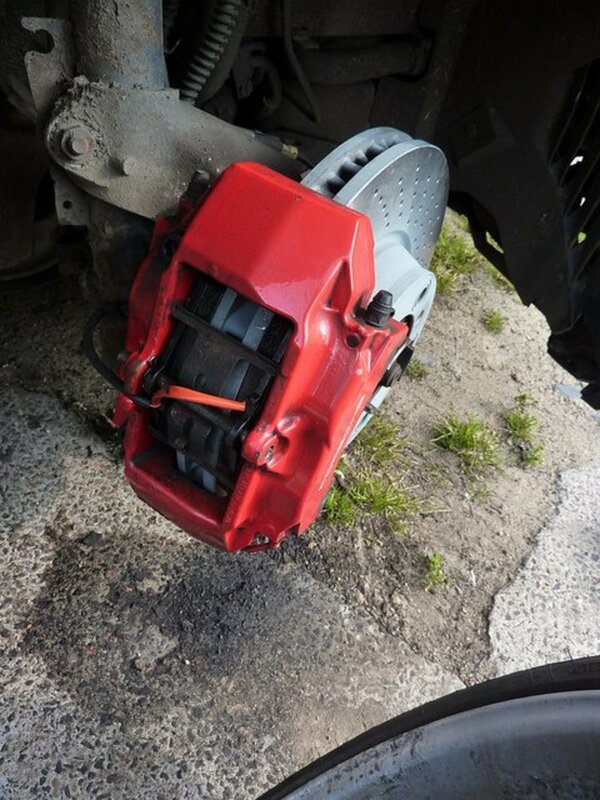 If necessary, remove the caliper from its mounting bracket, without disconnecting the brake hose at the back. 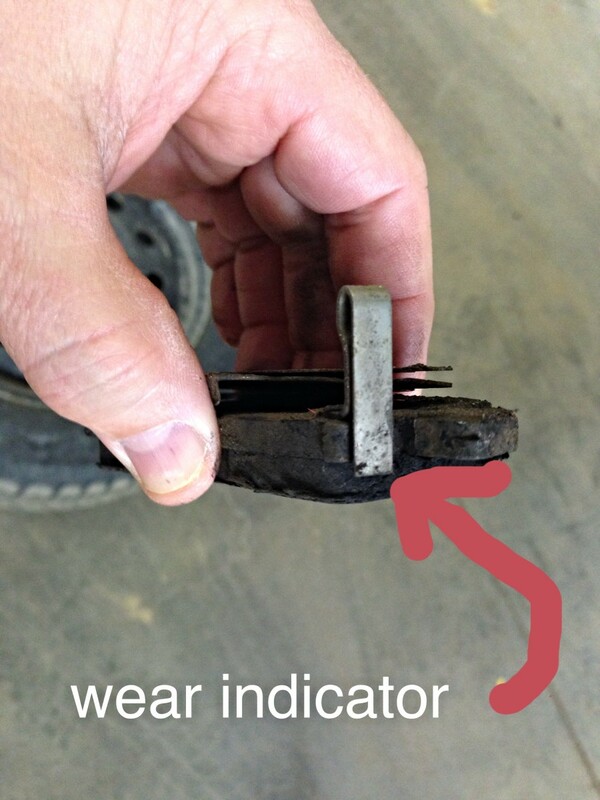 Look for signs of fluid around the caliper piston, which contacts the inner brake pad. Brake calipers have a piston or two that push against a brake pad when you apply brake. The piston's rubber boot and cylinder may develop leaks over time due to wear or damage. 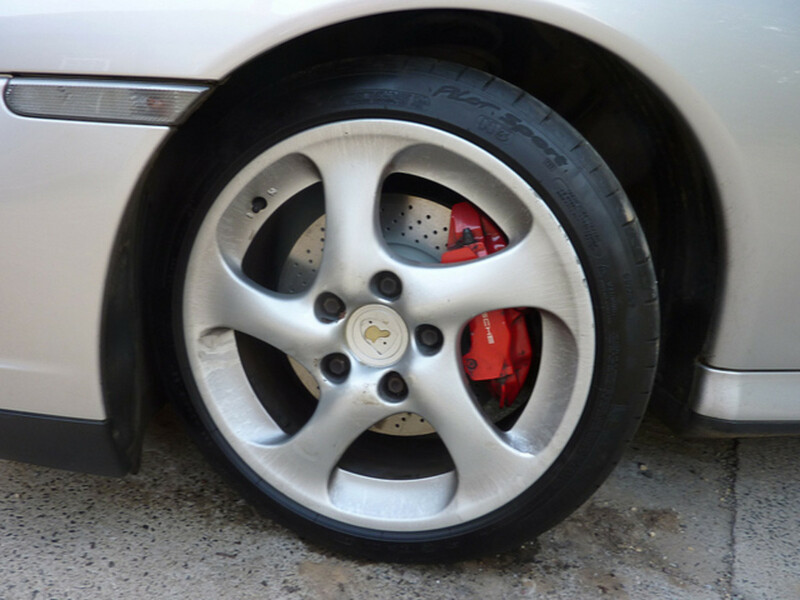 Some vehicles use brake discs on front and rear wheels. Other models have brake drums on the rear wheels, which use wheel cylinders to activate the brake shoes when you apply the brakes. On brake drums, you'll need to remove the wheel and tire assembly, and the brake drum to gain access to the wheel cylinder assembly underneath. Check the repair manual for your particular vehicle make and model, if you don't know how to remove the drum. If you don't have the manual, buy an aftermarket manual. They cost a few dollars and you can find them at most auto parts stores and online. Once you remove the drum, you'll find the wheel cylinder assembly towards the top of the drum brake assembly. Look for signs of wet spots around the assembly and the cylinder. Just like calipers, pistons and other internal components in wheel cylinders may develop internal leaks due to wear or damage. Carefully pull back the rubber boots on each side of the wheel cylinder to check for signs of leaks. If you find any signs of leakage, repair or replace the wheel cylinder. If after having checked the brake master cylinder, caliper, and wheel cylinders you haven't found the leak source, it's time to check brake lines and hoses. For this part of your troubleshooting section, you'll need to raise your vehicle to follow each line. Tube lines connect the brake master cylinder to the hydraulic modulator (if equipped), and extend all the way to each wheel, where small brake hoses connect to calipers on brake discs and wheel cylinders on rear brake drums. Jack up one tire at a time for inspection. Use a floor jack and support the car with a jack stand as necessary. Using a flashlight, follow each line, paying attention to wet surfaces and signs of damage. Use your fingers to confirm fluid leakage around lines or hoses. If you find moisture, make sure it is coming from inside the line. Wipe the lines clean using a rag as necessary. Pay particular attention where lines connect to brake hoses at the wheel assemblies. Check the brake hoses for darkened areas and damage as well. 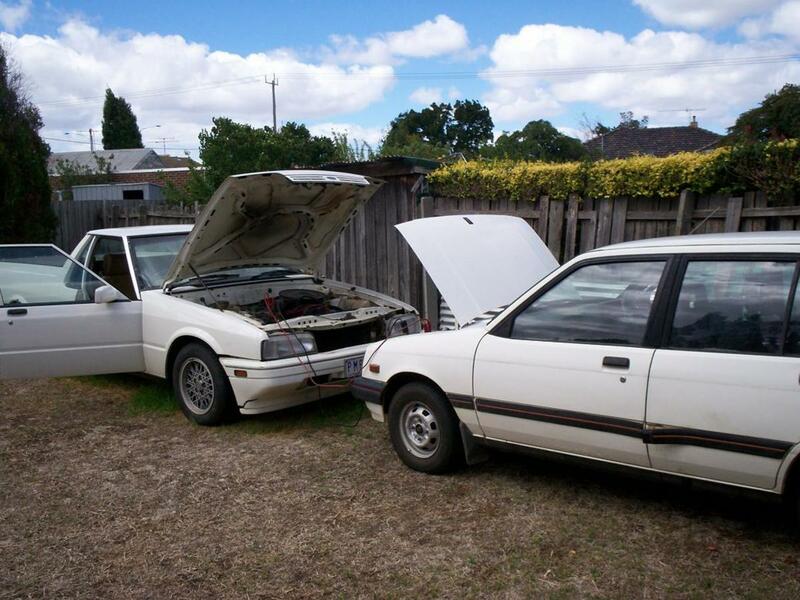 Once you've found the source of the problem, you need to decide whether to take your car to the shop or try fix the problem yourself at home. Either way, don't drive the vehicle until you fix the problem. If you only need to refill the system with brake fluid, you may also need to bleed the lines if the reservoir was initially empty — air probably found its way into the system. You can do this with a brake bleeding kit. The brake master cylinder, wheel cylinders, and brake hoses are the most common sources of leaks in a brake system. If you need to replace any of these components and you have some experience in car repair, you may be able to do this job at home, depending on your particular vehicle model. Follow closely the instructions in your car repair manual. You'll spend around $100 dollars for a master cylinder, $10 to $100 dollars or more for a wheel cylinder (depends on the car make and model), and about $10 to $20 dollars for each brake hose you need to replace. Also, you might want to buy a brake bleeding kit to make your job easier. 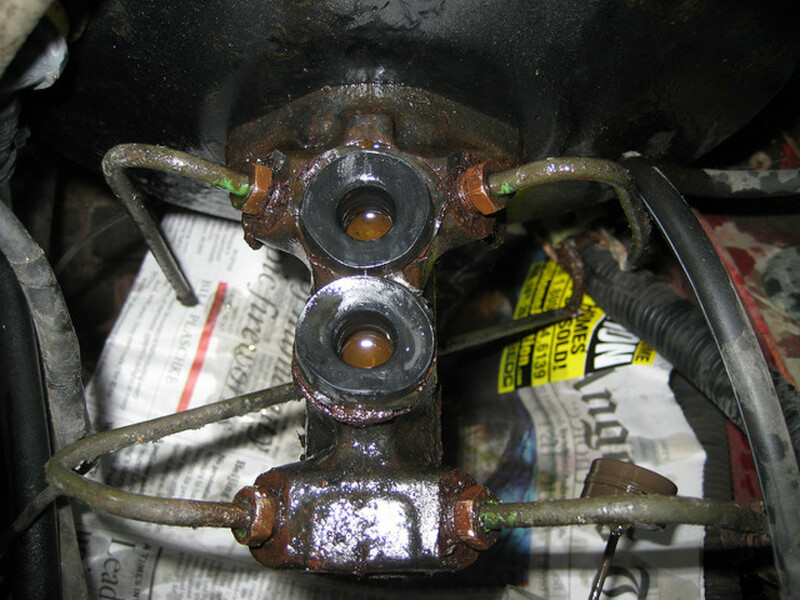 When replacing a master cylinder, you need to bleed the unit prior to installation. Also, you need refill the system and bleed the brake lines — this is done any time you disconnect a component for service like a brake caliper, master cylinder, wheel cylinder, or brake hose/line. Keep in mind that checking the brake fluid level and condition every week or once a month will help you spot potential problems before they turn into expensive repairs and dangerous situations on the road. Usually, brake fluid should be about 1/4th of an inch (6mm) bellow the top of the reservoir or between the MAX and MIN marks on the container. When necessary, consult your car owner's manual. A brake fluid leak can happen almost anywhere in the system. Using this guide will help you find the trouble spot faster, so that you can fix the problem as soon as possible. And even help you save some money in repairs in some cases. My Isuzu Trooper is leaking from the bottom of the drum section. What could cause my Isuzu Trooper's drum section to leak? It could be the wheel cylinder, the brake hose that leads to the wheel cylinder or the brake line itself. Raise the rear wheel with the leak using a jack and check behind the wheel. See if you check the brake hose and line. If you don’t see the leak, most likely you’ll need to remove the drum to check the wheel cylinder. Hope this helps. I have A Peugeot 206 2005 model with under 1200,00 Kim's. There is a brake fluid leak. Does that mean that the ABS module needs replacing? No, not necessarily. Usually, the master cylinder, brake lines, caliper pistons will wear out before the ABS unit leaks. This unit seems pretty solid, from what you've shared. You need to find the source of the leak first, and then take it from there. Wipe clean the lines and master cylinder using a rag and then fill the reservoir again and see where it starts leaking. It could be at the master cylinder or a broken line. so my 2004 buick century has a very bad brake fluid leak i cant tell where its coming from its all over absolutely has nothing left in the compartment its all over my break lines other places underneath the car and my drive way what should i do?